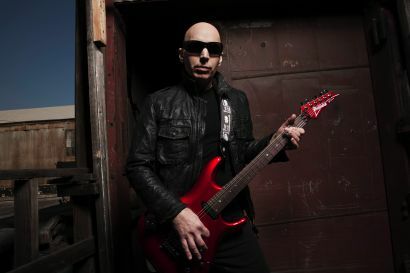 Joe Satriani discusses his inspiration behind the writing and recording of his new album, "Unstoppable Momentum", in the first of a new 3-part video series. In part 1, Joe discusses the abum’s concept, plus working with Mike Keneally (who was also on 2010's “Black Swans & Wormhole Wizards”), and new collaborators Chris Chaney (Janes Addiction) and Vinnie Colaiuta (Jeff Beck, Sting, Frank Zappa). The video series also features exclusive behind the scenes footage of the recording sessions and samples of tracks from the album. "This is what I do, it's what I've always wanted to do,” explained Joe, “... in service of achieving that never finishing artistic quest - that's what it is and what it's all about." “Unstoppable Momentum” recently debuted at #42 on the Billboard 200 charts with first-week sales of around 11,000 copies, marking Satriani’s highest US chart debut in over 20 years. The guitarist just kicked off an extensive European tour; a North American trek starts August 29 in San Diego, CA.